Hey folks, what’s up? It’s been a week since my last post on these EXTREMELY cute mini vanilla doughnuts and boy has a lot happened! Every now and then you get one of those crazy weeks where it all seems to kick off. Highlights of my week include a mini-school reunion with best friends from primary/secondary school/sixth form!!! A curry with Mr KG and our friend who has been working out in South Sudan for the last 4 months – he just headed back out there yesterday so it’ll be a while until we see him again. I also got my law school results – I passed with Distinction 😀 every single exams I got a distinction in so I’m a VERY happy girl. Shame no-one is planning to go to graduation, what with us all out working. Then there was the not so good part of the week – I’ve been complaining of strange aches and pains most of the week. On Friday this turned into excruciating pains in my stomach as well as arms and legs. In the evening it hurt so much it was making me feel sick! So for the last couple of days I’ve been laid flat out either on a sun lounger, sofa or bed. It is seriously boring being ill and not much fun being in pain!!! It has meant though that I’ve been able to catch up with lots of blog posts from you lovely guys! This evening I’m thinking about getting back in the kitchen – or perhaps should I say instructing my Mum in the kitchen. It’s probably not a great idea I get stuck in with the food prep being ill and my Mum could do with a bit of practice. There’s still no news on our flat but hopefully we’ll have all the paperwork signed in the next week or two. Keep your fingers crossed for us!!! In the meantime I’ve got to teach Mum how to cook (or just get more confident) in the kitchen. This recipe is one we cooked together a week or so ago. We’ve had it quite a few times and each time she’s helped out a little bit more. I reckon she’ll be able to whip this up for her and Dad in no time now! The key with this dish really is the fish. I’ve chosen to use white fish of your choice as the base – think Cod, Pollack, Gurnard or anything else mild and flakey. But it also includes prawns and smoked haddock and this is really where much of the beautiful ocean flavour comes from so please, please, please don’t leave these out! My Mum was never a big prawn lover but she enjoys it in this pie so just give it a go and I’m sure you’ll surprise yourself. I also love this recipe because it’s another great one for hiding vegetables from my Dad!!! Broccoli, peas, leeks and sweetcorn can all be hidden in the sauce from grumpy old folk and children. What I love the most about this recipe though is the crumble topping. 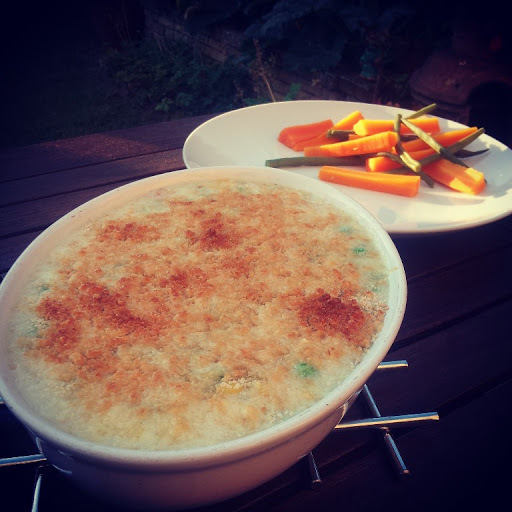 Mash potato and puff pastry are great ways of topping off a fish pie but this cheesey breadcrumb top is lighter making for a healthier pie and something more suitable for the summer evenings. Fry off the leeks (sliced) with a little bit of butter. Once the butter has melted and the leeks are translucent add a tbsp of flour and stir so they are fully coated. Slowly pour the milk in until the flour is dissolved. Bring the milk to a simmer for 5mins adding bay leaves and some pepper. Add in the frozen vegetables and bring up to a simmer again. Cut the fish into square pieces and stir into the sauce. Cook for another 10mins. Try avoiding stirring so the fish doesn't break up. Whilst the fish is cooking steam the broccoli and carrot so that they can be added to the sauce already cooked. Next add in the prawns along with the steam broccoli and carrot. Stir gently letting the sauce thicken for a further 5 minutes. Once the sauce is a thick and creamy consistency and the fish is cooked through, transfer to a pie dish. Combine the breadcrumbs and cheese together. Sprinkle the crumble topping all over the pie and season before placing under a medium-hot grill for 2-5 minutes until the topping is golden and the sauce bubbling. Serve with extra vegetables whilst piping hot! This humble pie has become quite a part of our mid-week meals since I’ve been back at uni. 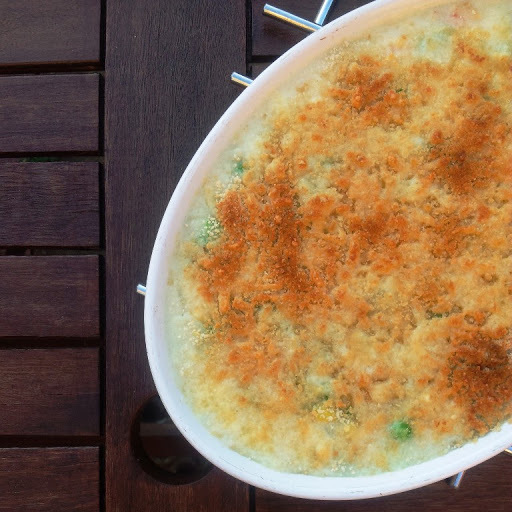 Fish pie was something I loved to cook for myself when I lived up North. I’d scour the discount sections and fish counters for scraps that I could easily chuck together. I’m slowly starting to see this as a “family” dish and it’s nice, homely, comforting food. I’m a little bit sad I don’t have all the nostalgic memories of other foody comforts, like mince and dumplings of shepherd’s pie cooked by my Nan! 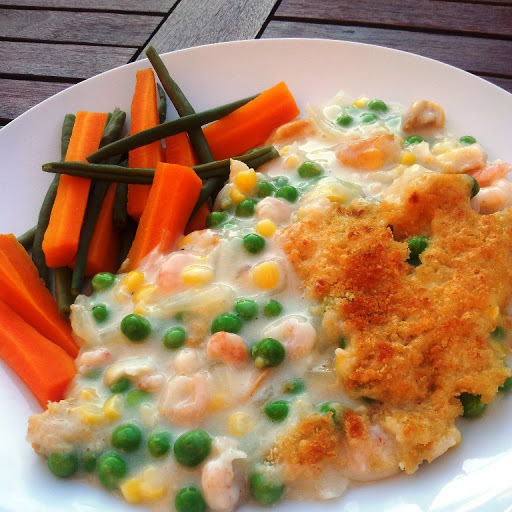 Does fish pie in any of its varieties feature in your childhood memories or is it something you’ve only cooked in the more recent past?